Local Notting Hill resident Rachel Kelly has just launched her second book "Walking on Sunshine: 52 small steps to happiness" where she shares strategies that have helped her stay calm and happy since overcoming depression. In fact, the book provides nuggets of wisdom that will undoubtedly help anyone feeling gloomy, anxious, depressed, stressed – these things affect us all. At the book launch (two weeks ago) we were all asked to raise our hands if we or someone we know had been linked to any of the above and not one person kept their hand down. We were also asked if we rated ourselves as fundamentally happy – and the answer for many is: probably not. Tips and tricks are provided for every week of a calendar year and as the book is written like a diary the chapters are grouped into Seasons. It also contains wonderful illustrations by Jonathan Pugh. There are also exercises Kelly has found helpful, like: Place your index finger on the side of your nose so you only breathe through one nostril. This instantly slows your breathing and makes you feel calmer in the heat of a stressful moment. Chapter 13 (page 40-41) – Late May, and one overcast morning, my friend and I make time for a special breakfast. We go to a local restaurant and a waiter cracks a smile and gives us a corner table. The porridge is drizzled with honey and dotted with blueberries and raisins. I feel blessed that we are together and all is well in this moment. In the evening, I reflect on the gratitude I feel for such a pleasurable start to my day. Having suffered from depression in the past, I’ve found it helpful to focus on my mental health rather than my mental illness. Learning to be grateful is a key part of that philosophy. The rest of that chapter on gratitude goes onto describe some brilliant techniques and exercises to try – and even one that is great for children – so often we can forget what to be thankful for – and there really is so much. 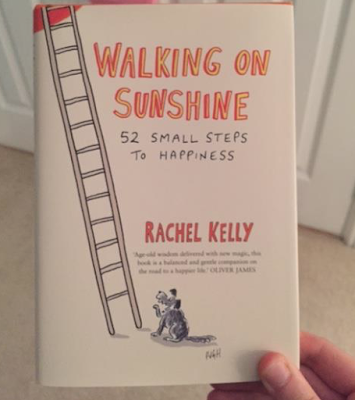 It is individuals like Rachel Kelly who bring so much good to the mental health world. Long may her work continue.